Campaign Thugs – Littman, Sherlock & Heims P.A. Martin County Commission election thugs knocked over or ripped up campaign signs along East Ocean Boulevard this weekend. Only Sarah Heard and Ed Fielding signs were targeted. 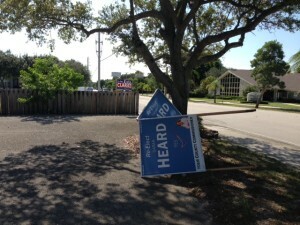 Signs for other candidates were untouched. Increasingly vicious attacks by opponents of Commissioners Heard and Fielding are aimed squarely at the rights of citizens to speak freely and express our election choices. Destruction of large signs and throwing beer bottles at small ones are the acts of desperate and angry Heard and Fielding opponents. The unusually nasty campaigns that have been waged against Commissioners Fielding and Heard have included anonymous e-mails and videos as well as Big Sugar-sized postcards. These tactics have not been disavowed by challengers Stacey Hetherington and Barbara Clowdus. Hetherington spent years promoting a rockpit owned by George Lindemann, Jr., who was convicted of having his horse electrocuted to collect insurance proceeds and who has poured thousands of dollars into Hetherington’s campaign from his Miami headquarters. Clowdus has supported Extreme Sports Water Park, Hobe Grove and the Kanner Highway truck stop in a community newspaper featuring advertisements for Hobe Grove proponent Becker companies and for Big Sugar. We are all entitled to support candidates of our choice and to display our choices on our property. Those rights cannot be taken away by campaign thugs who tear down signs and send out photoshopped postcards. Despite the worst efforts of the campaign thugs, citizens retain the most powerful weapon against this assault on the democratic process — the right to vote for Sarah Heard and Ed Fielding, who represent the best in Martin County.